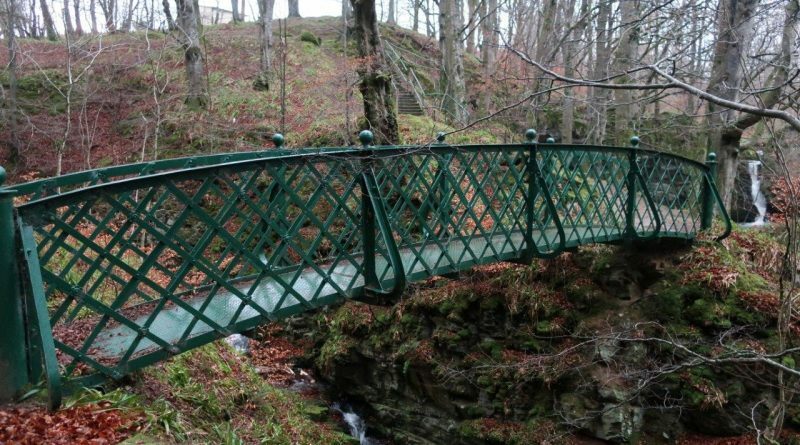 Keith is in the heart of whisky country, so a brisk walk could be just the thing to clear the head the morning after a dram or two! There is plenty of countryside around the Moray town, and this little circuit offers an easy way to explore some of it, starting in its main square. I found myself in the market town one Sunday evening with just about time to explore this route before the light faded. Starting at Reidhaven Square, the main square in Keith, and facing the prominent St Thomas’s Chapel, it follows the road leading left away from the mini roundabout. The path rises above the Den Burn. At the end of this road, turn left and follow it down to the main road, which you cross carefully to continue along the road opposite, forking right almost immediately onto Old Den Road. There are a few big houses on the left here and after the last one a path climbs up into the woods beyond. Take this path and follow it, sticking to the main route past a housing estate up to the left, as it passes mature trees, some with bat and bird boxes attached. It’s not long before you’ve left the edge of the town behind, despite the noise from passing traffic on the A96 a little way below you. The path eventually drops nearer to the burn then, after a short rise, watch out for an unsigned fork and follow the route down to the right to cross a little green bridge in an open area. 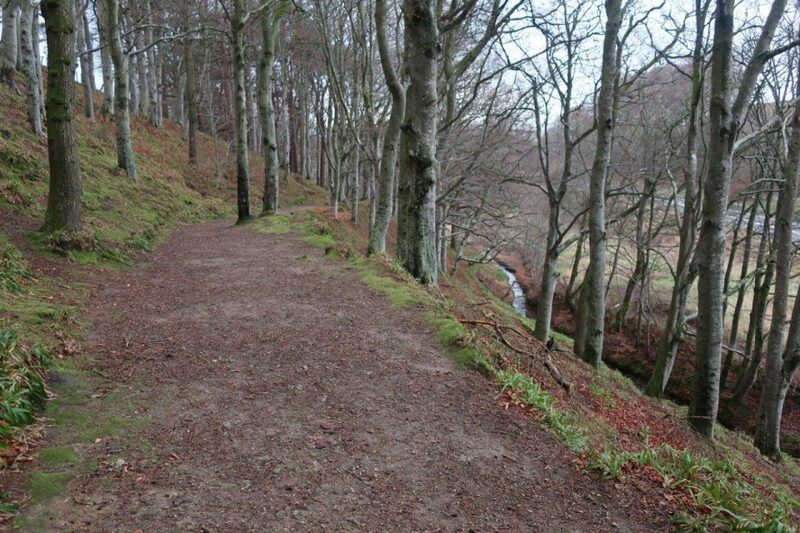 This is a popular local route and it’s easy to see why as you follow the path alongside the burn to arrive at a junction in sight of the Falls of Tarnash. I followed the sign right to cross another rather elegant-looking green bridge and take a closer look. 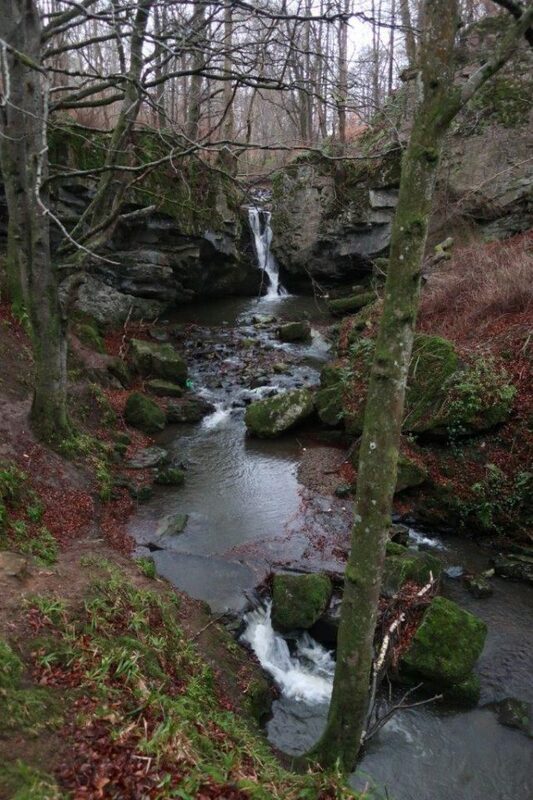 The peaceful spot of Tarnash Falls is within easy reach of Keith. The falls are not high but they are an attractive feature, with the burn narrowing through rocks to plunge down into the pool below then continue its course, tumbling down through rocks and earth. Even the little gorge that the bridge goes over is notable for its height and adds a surprising sense of wildness to this evening stroll. I returned over that bridge to the signpost and followed it right towards Dunnyduff. 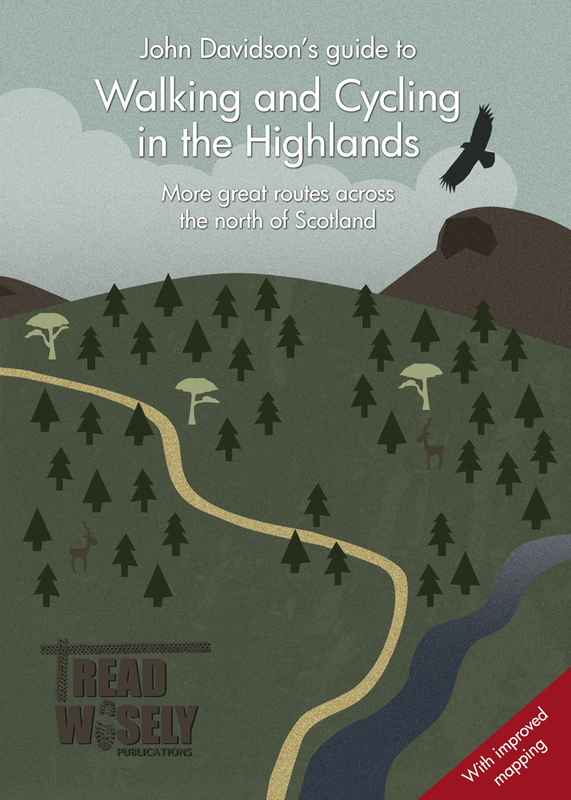 This route climbs a series of zigzag steps into the forest above, gaining height quickly before easing as you approach a junction, where a marker post points diagonally left over a mini bridge. Follow this track through the woodland as it narrows to a nice path that winds between the trees, bearing right after another little bridge near the edge of the forest. 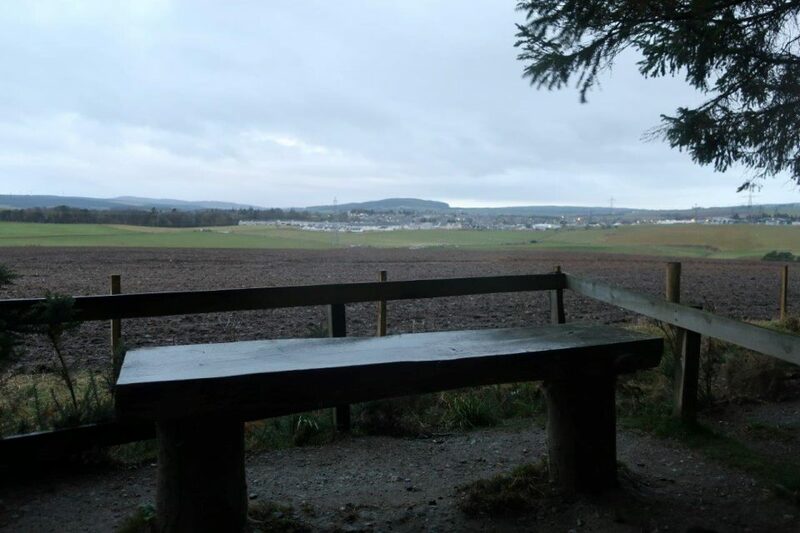 The way now follows the edge of the woods with glimpses left over Keith before entering a thicker, darker bit of forest, where there’s a bench with a better view over the fields to the town. You can just make out the red dome of St Thomas’s from here though in the fading light it was not very clear tonight. Overlooking Keith from the bench within Dunnyduff Wood. I continued through the trees, the path soon dropping nicely to reach a track, which you follow left to pass a gate at a small parking area. This merges onto the road, which you follow straight ahead for 50 yards or so before keeping to the right-hand side at the corner. Here a nice grassy track drops below the road to follow the Burn of Drum parallel to the road, emerging back on the tarmac at Dunnyduff Bridge. Follow the single-track road right, going up the hill then round sharp left then right-hand bends to arrive at a half-built housing development. The route back to the square is fairly straightforward from here, continuing along this road which veers diagonally left to reach the A96 opposite the square.